In modern construction, interiors are finished with sheet rock, exterior stonework is held together with concrete. These products have one thing in common: you buy them. They are available “Off The Shelf” at most building supply stores. Our historical ancestors, living in the 17th and 18th centuries, also had one common way to deal with these same problems: you make your own. Along the costal waters of “The New World”, the practice of making plaster, which could be transformed into mortar for stone or brick usage by adding sand, was well known and common. Today it is a lost art. But Brian Cooper, of Early New England Restorations, Pawcatuck, CT, is constructing an authentic 18th century reproduction for the Pendelton – Chapman House, at 2 Avondale Road, Avondale, RI. 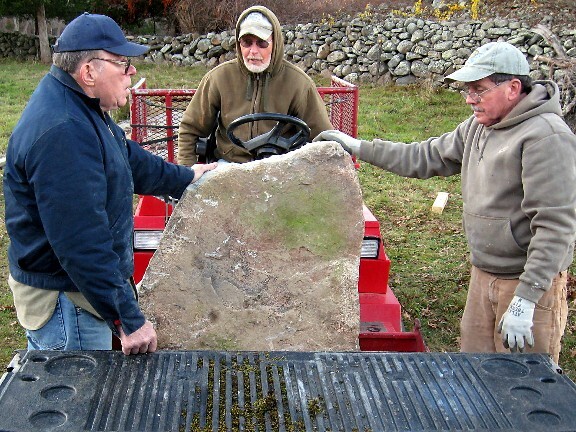 This is a meticulous project, requiring Brian to use his decades of experience as the owner of Early New England Restorations, but going deeper into history. Instead of using re-purposed colonial bricks and glass, of which he has an extensive supply, this job requires him to make his own plaster, bricks and glass using the authentic methods of the 1700’s. The first problem is the most obvious: Who would know how to DO such a thing? The answer was equally obvious: The curators of the walk through museum at Williamsburg, VA. 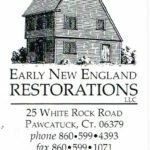 This video will give you an overview of the work Early New England Restorations will be undertaking during 2013, 2014 & possibly beyond. 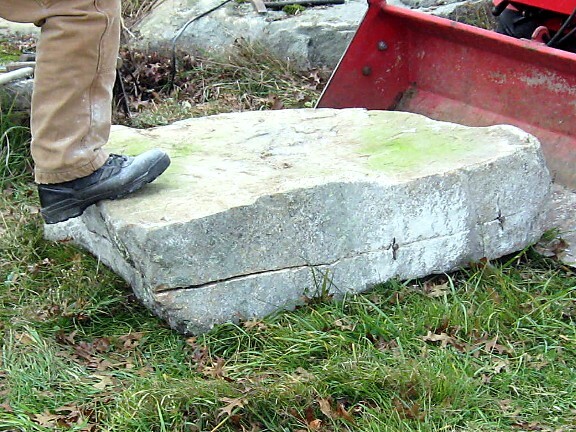 Lime was vital to many building trades in the 18th century. To obtain lime, oyster or clam shells were burned in a “Rick”, an open air wood pile constructed specifically for this purpose. Wood was stacked up in a circular form which allowed air to penetrate to the center of the Rick. There was a tower of sticks and kindling which served as the wick for lighting the firewood of the Rick so it would burn from the center out. After the Rick was constructed to about 4 feet tall, oyster shells were piled up in a mammoth heap atop the wood, till they slid off the slope. The central wick was ignited, burned itself down to the center of the Rick, and the physics of combustion tool over for the next 24 to 48 hours. After the Rick cooled, the burned shells were collected in smaller amounts within a bucket, and warm water was poured over them. The burned shells, now “Lime”, chemically different than an unburnt oyster shell, react instantly to the presence of the water, giving off enough heat to instantly make the water boil. This new chemical is called Slacked Lime. This is what will become the Plaster or Mortar after it sits, hydrating underwater for 6 months. 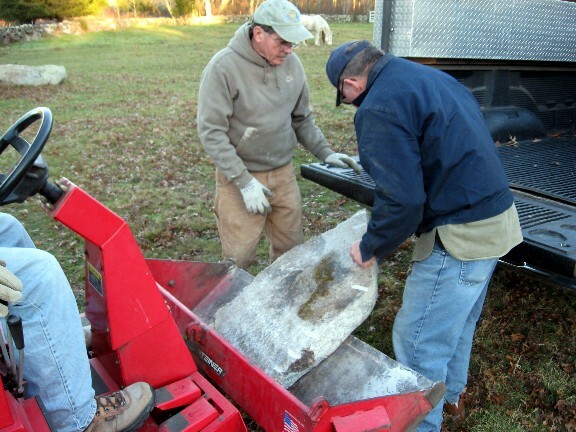 The Slacked Lime is scraped through a screen into a “Lime Pit”, the screen removing the bigger impurities. During the 6 months of sitting underwater, many of the other impurities settle to the bottom of the Lime Pit. When it was time to use the Slacked Lime as Plaster or Mortar, the quantity you needed was removed from the Lime Pit, and the finer components needed to make plaster of the desired texture were added, or the coarser components, like sand, were added to make the Slaked Lime into stone or brick mortar. Colonial Plaster had to be stored underwater to prevent it from curing into Plaster or Mortar. Modern Plaster requires water to be absorbed to produce the chemical reaction which hardens into plaster. 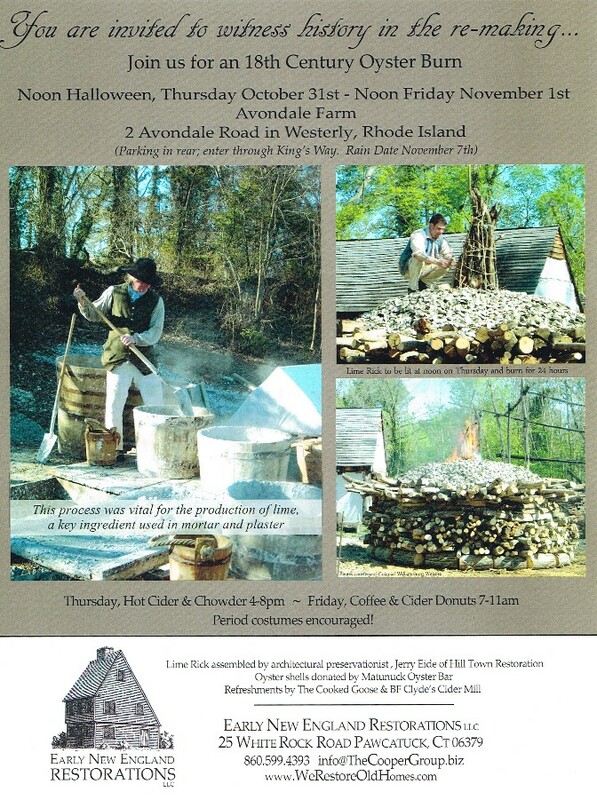 Beginning the evening of October 31 through the day of November 1, 2013, the public is invited to view what may be the first Rhode Island “Oyster Shell Burn” in nearly two centuries, as well as tour the historic “Avondale Barn” project at 2 Avondale Road, Avondale, RI. 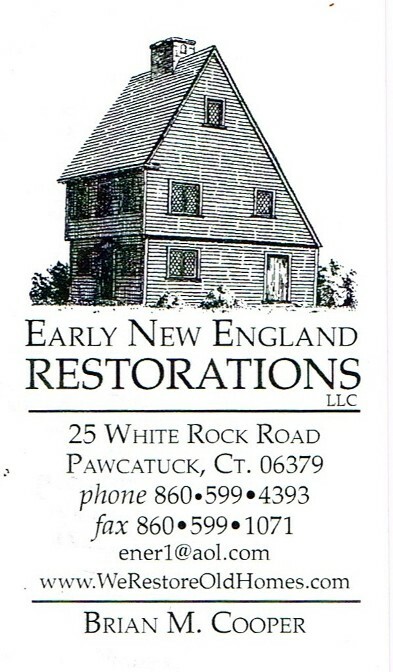 For more information, please call Early New England Restorations, (860) 599 4393. This page will expand as HHA covers the Avondale Oyster Shell Burn, from preparing the Rick, the actual burn, the Slacking, Storage and eventual use in the historic Pendelton – Chapman House Project. Bad weather delayed the burning of the 10 cords of wood, bearing 3,500 pounds of Oyster Shells until Saturday morning @ 9:00. You will find four different slide shows recording the burn and those who came out to see History in the Re-Making, as well as two videos from shortly after the “Fuse” was lit, (sticks and kindling in the center of the Rick), and one video at the height of the burn. The initial videos record the sound of the “steam popping” of the wood within the core as the heat builds up. No one expected this sound, but it was very loud, and not that surprising after a few moments of thought. You hear it with a small camp fire. With 10 cords of wood ignighting at once, the “Pops” were very frequent! One of the slide shows also has photos within the historic barn. Later, the page will be expanded to show more of the barn and the construction of the Rick. All pictures and videos were taken by HHA Member Tom Helmer. 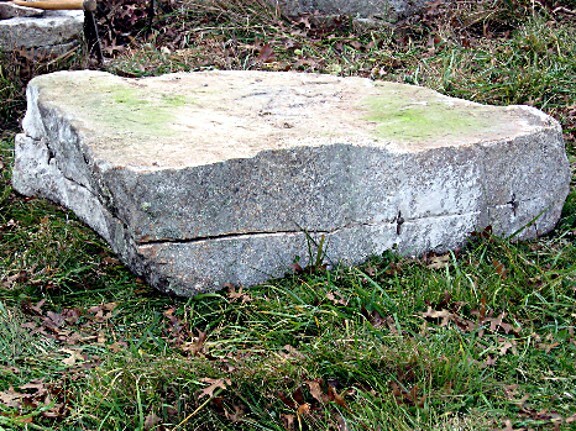 Prior to the mid 1700’s, the Colonials and Indigenous Peoples depended on finding stone that was already near to the shape they wanted. The Indigenous developed techniques for refining the shape and adding realistic detail, sculpting the rock for their ceremonial purposes. The Colonials were concerned with staying alive, and had no time for modifying rocks when there was real work to be done. 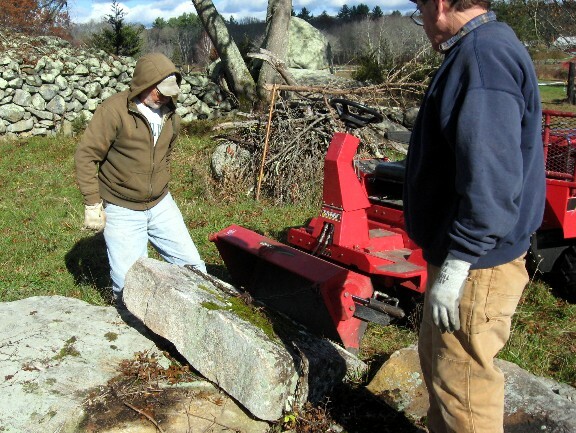 However that attitude changed with the discovery of a way to control how a rock splits, enabling the Colonials to cut flat, square edged rocks to size from the New England abundance of glacial deposits and bedrock ledges. Rock Drills, a steel shaft about 5/8 of an inch in diameter and a foot long. The “Hammer” end was cut off square, the “Drill” end was shaped into a “dash”, a 5/8 straight line coming to a narrow edge. “Feathers”, a pair of iron or steel strips, about 3/8 wide and 2.5 inches long. One side of the strip was shaped into a semi circular cross section, the other side was flat. One end of each “Feather” was bent over at 90° on the semi circular side, so the bend covered over the semicircular face. “Feathers” were always used as a pair. Wedge, a stubby shallow angled wedge about 2.5 inches long and about ½ inch in diameter. One Wedge and two Feathers were required for each drill hole hammered into the rock. The Colonist, or an Indigenous Person who was taught the secret, first marked and drilled a series of holes in the rock to be cut. These holes were laid out in a straight line, and about 5 inches apart. 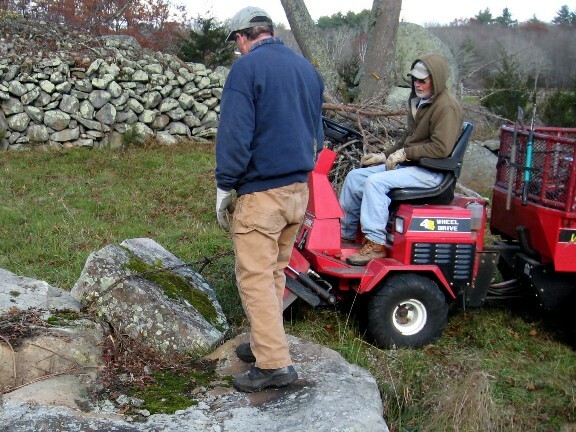 They frequently made their job easier if the Stone Cutter could discern a pre-existing fissure in the rock that was in the proper orientation. 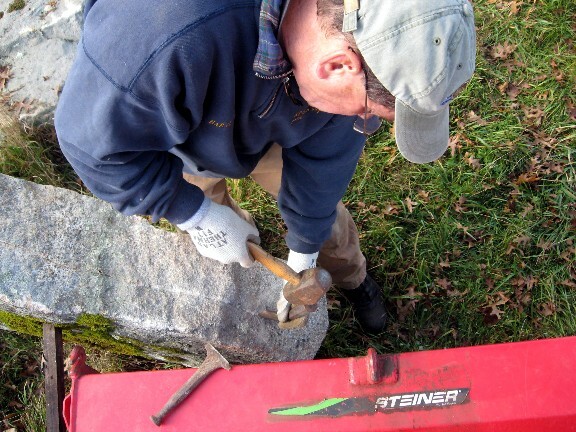 A skilled Stone Cutter, whacking away with a heavy hammer while simultaneously twisting the drill rod, could produce a uniform diameter drill hole in 10-15 minutes for each hole. 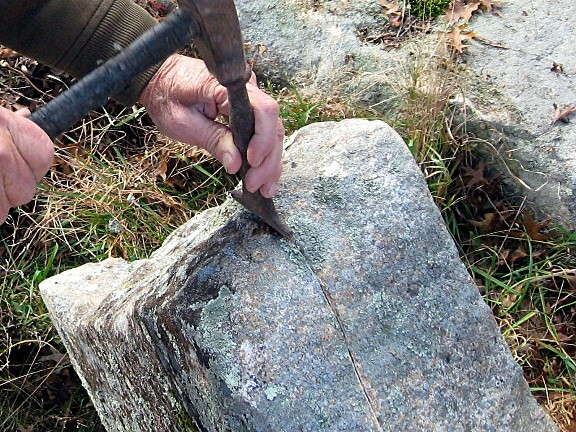 Once the holes were all drilled, the Stone Cutter would insert a pair of Feathers in each hole, with the bent over tabs marking the direction he wants the rock to split. The wedge is inserted between the feathers so it’s sloping angle will push the feathers apart as show by the tabs. Next, picking a likely end or a helpful fissure, the Stone Cutter would lightly begin driving the wedges in between the feathers. The sound the rock makes will tell him if it is splitting, or if it remains “sound”. A tap in a split area will be a dull thud, a sound portion of rock will be distinct: it might even ring like a bell. The Stone Cutter should be patient, and keep walking up and down the drill line, tapping each wedge just a little further in between it’s feathers. He will keep a sharp eye on the rock between his drill holes, looking for the tiny crack that connects the dots, showing that the slab has begun to crack per his instructions. He will keep on tapping and extending the crack further. He may wallop the rock, not a wedge, in an area that is sound and resistant, hoping the shock will let the crack spring forward. Frequently, a few taps on the holdout drill holes will produce a faint motion, and he will see the crack running the length of the stone, and all the drills give the dull sound. 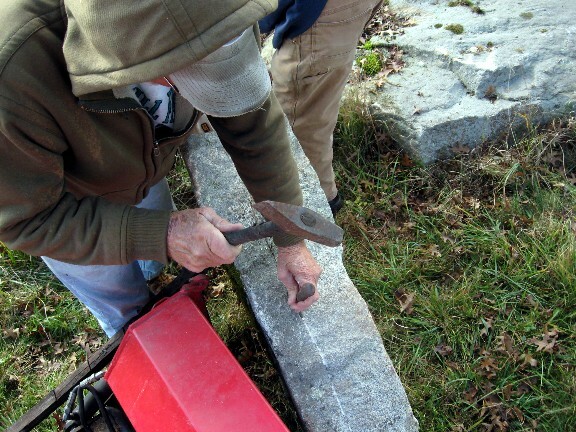 He will tap the wedges in deeper, forcing the stone to slip away from the rest of the rock. Then, if it is a big time quarrying operation, he will give a whistle for the Lads to come a-runnin’ and let them cart off the slab to the ox drawn wagon while he sets up the next cut. 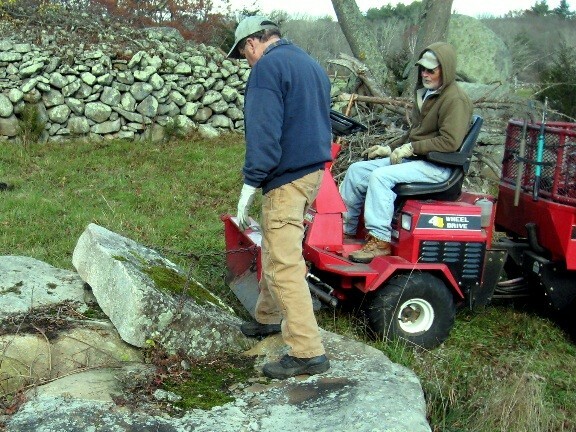 A Stone Cutter was a high tech position, and his time was valuable. 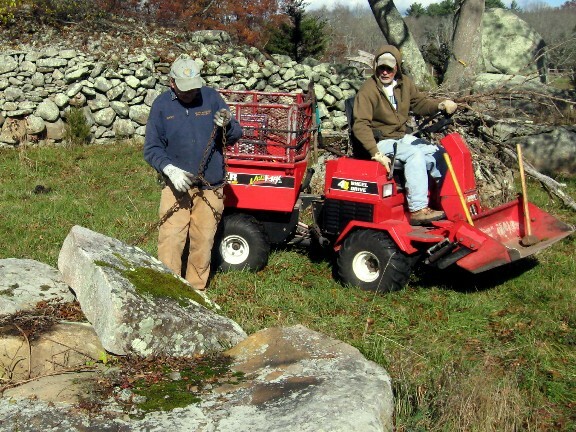 In spite of the evidence to the contrary found in the miles of stone walls sleeping in our New England Forests, we have a modern hubris that says those old boys were not particularly bright; after all, WE have Smart Phones, like “we” build them ourselves them. 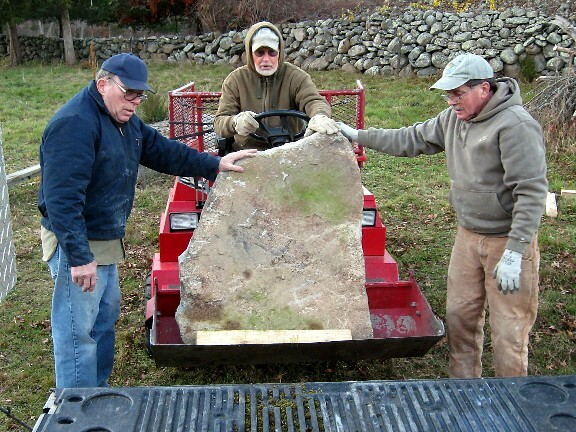 But there is a picture in the HHA Archives that shows how a 3 man crew, without modern equipment, can move and place the heaviest of stones. 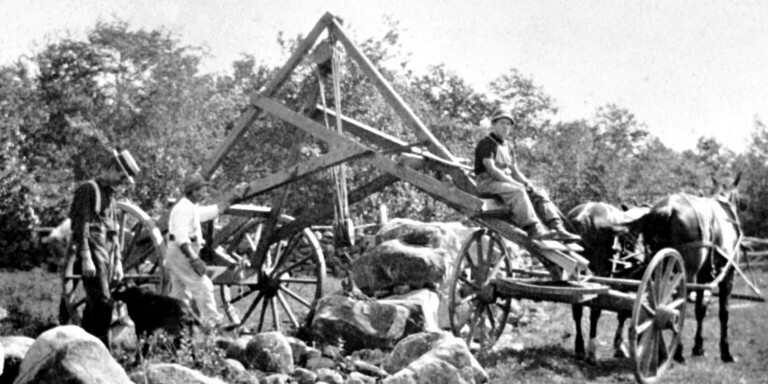 Study this articulated specialty rig which, using only rope and pulley blocks, can lower a big stone on a dime. You may want to reflect on the massive wall they already built before foolishly calling them “Stupid” to their face. 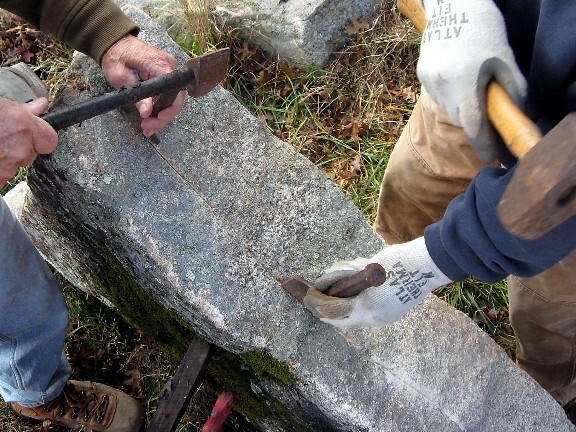 The modern Stone Cutter still uses the “Feathers & Wedge Technique”, only now he uses a powerful electric “Hammer Drill”, which both twists the bit and pounds it rapidly as it bores into the rock. Everything else is the same as Colonial times. A skilled modern Stone Cutter with a Hammer Drill could produce a uniform diameter drill hole in 2 minutes or less for each hole. 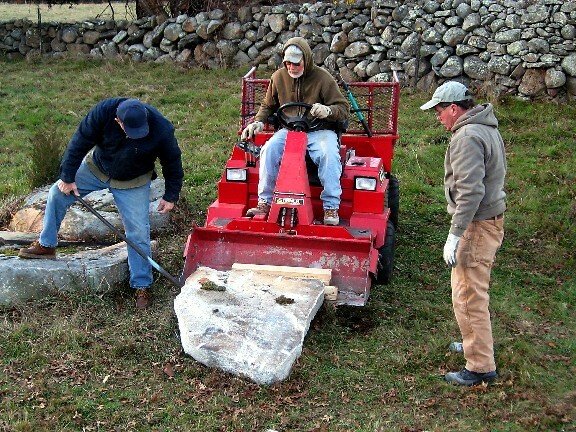 The following Photographs and Videos show Bob Miner, Harvey Buford, Tom Helmer & Ted Dionne cutting two slabs of stone in Bob’s field, using a portable electric generator and his hydraulic utility vehicle. November 8 was partly cloudy, cold and windy. 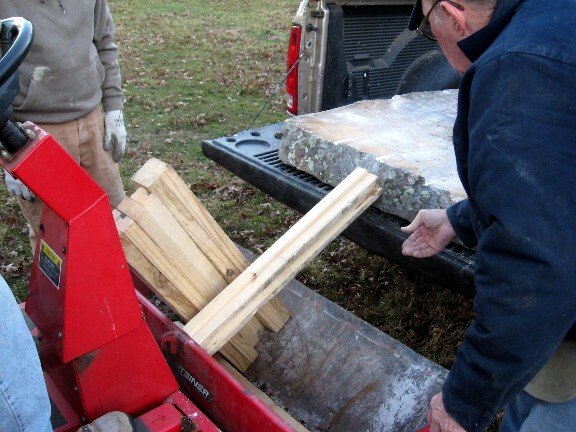 The entire process took 3.5 hours total, from start to Harvey’s truck all loaded up. 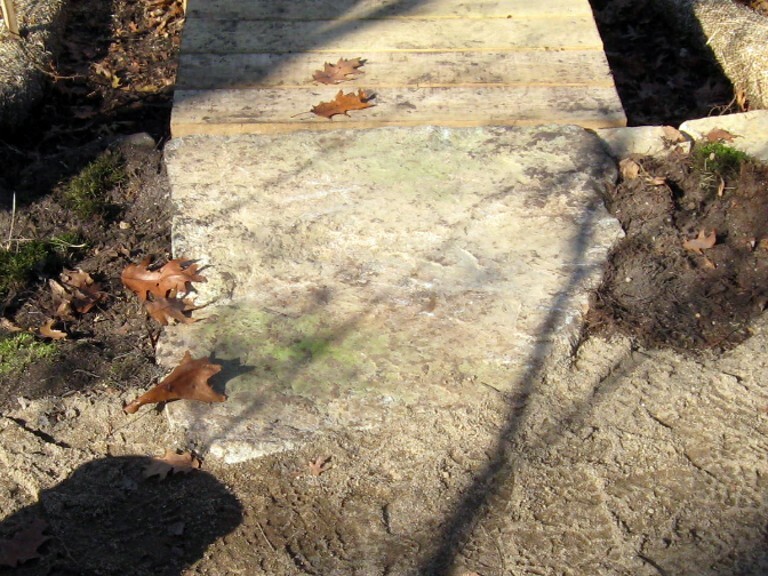 The cut stones will become the “Entrance / Exit” platforms for the new 55’ bridge on Tomaquag Trail. You might like to see the construction of this trail on the “Grills Trail Bridge Progress” page. 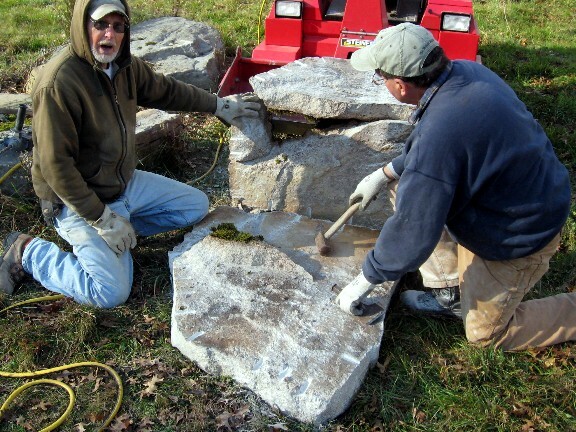 We hope to split an 800 pound rock edgeways, like opening an Oreo, except there is a no soft filling within. But there is the trace of a fissure running the way we hope the cut will go. 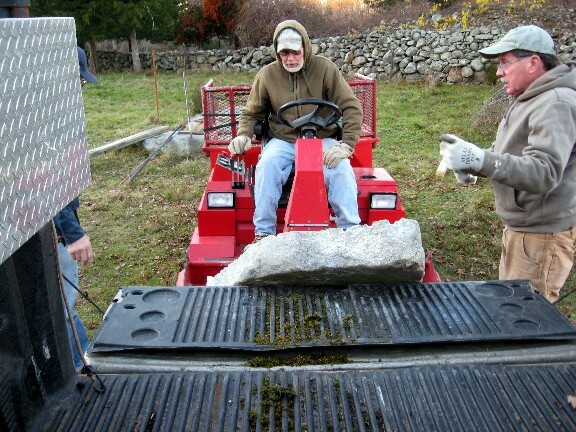 Bob and Harvey have already selected the stone to cut, and with the generator and gear in the trailer, Bob is lifting the stone while Harvey “Foots It” The 4 men involved with this project are all up in years, meaning they have been around long enough that you keep your head focused on safety when rasslin’ heavy rocks. 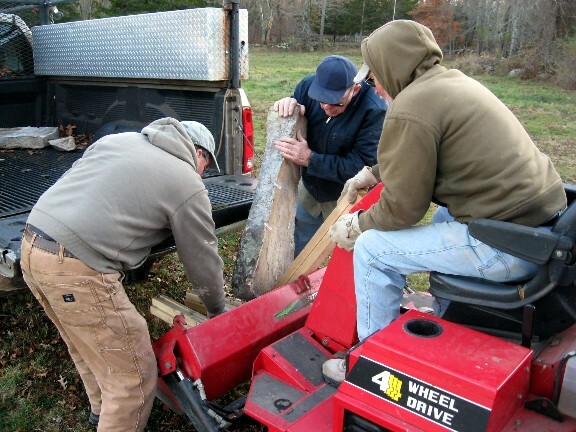 Moving a big boy like this up on edge is the perfect set up to breaking a leg ankle or foot. The slab is too slippery to trust it being lifted by the bucket, so Harvey gets the chain ready. A bit of communication about the plan, and then the chain is attached to the bucket hooks. Bob maneuvers the hydraulics, while Harvey again foots the slab. The slab begins to dig in and rotate upright. It will be much easier to drill the slab with it presenting its edges vertically. It will be much easier to drill the slab with it presenting it’s edges vertically. The slab is now upright. One man can holds its mass steady. 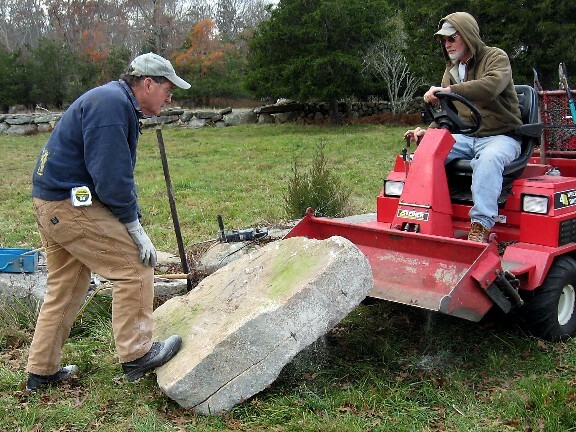 The rock is braced by a sturdy piece of wood, and the bucket provides some additional protection, but Harvey is aware that if the slab should somehow pitch his way, he will be moving instantly. The good news is there is indeed a fissure running the direction we want, although it is not centered to cut the slap perfectly in half. He is cutting into the fissure with a wide blade chisel. 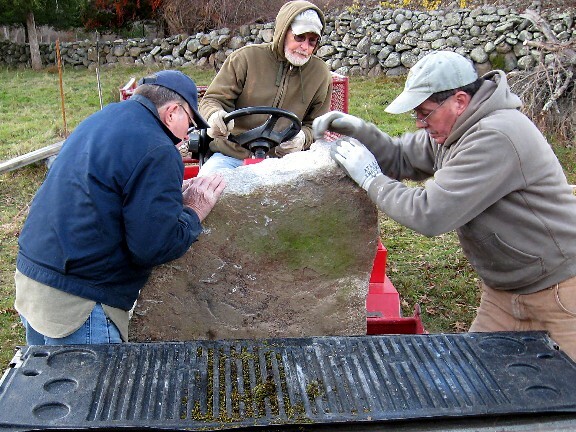 Perhaps the stone will cleave asunder without having to drill any holes. Bob works on the fissure from the top. Harvey tracks it around the side edge. Hoo-Ray! If you look carefully, you can see the fissure is already beginning to open. “Many hands make light work”. The fissure is distinct and growing wider with every hammer blow. But then they encounter an area where the fissure stops, and the rock rings a clear tone. We are going to drill in this tough area to help the fissure spread. We decide to drill a number of holes on the two edge faces we can easily reach. The drill is noisy, but when it stops, the generator noise dominates. This is not a project you want to do at 2 A.M. The drill wants to skitter when it encounters the rock surface. In this video, the holes have been drilled, the feathers & wedges are in, and they have been tamped down. Bob can hear that there is a sound place in the rock where the fissure has not penetrated, and wants to turn the rock over to drill the other two edge sides. As we go about flipping the edges to expose the two undrilled edges for inserting feathers & wedges, you can clearly see where the fissure is gaping open, and yet it is not budging in the hard portion of the stone. The crystalline structure is big and bold in this area, while is fine grained in the area of the fissure. Harvey foots the slab once again. Up it comes! Note the rock drill dust falling off the edge nearest the camera. Also note the concentration of both men. 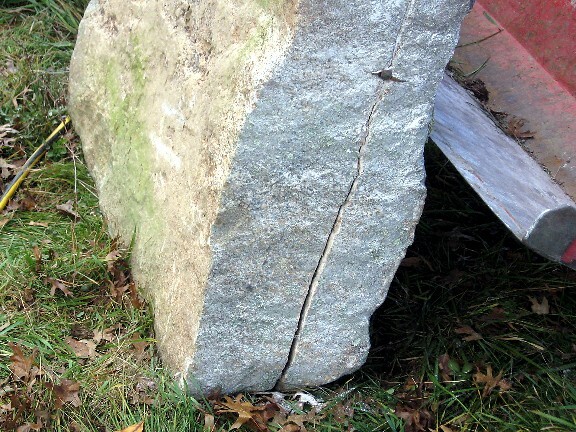 You would never think that a big slab of rock could bend, but there is the gap nearly a half inch wide at the bottom, and no gap in the middle. The fissure is being held open by the terrific pressure generated by the feathers and wedges. Just a thought, but when bedrock gives way under the pressure of an earthquake, when it snaps, there must be a whole LOT of energy released. As Harvey takes a turn drilling, note that the chilly wind has picked up. After a while, you get the feeling that old time Stone Cutters are at the opposite end of the emotional spectrum from Quarry Blasters. Drilling more holes on the fourth edge. Patience is the key. Trusting fingers holding the feathers, but still the fissure won’t extend. The fissure extends in the hard spot! Good News!! More holes, more tapping, still more holes. This is one tough rock! You can see Bob loading the feathers in a new hole, and if your ears are good, you can hear the rock ring when he taps the remaining hard places. 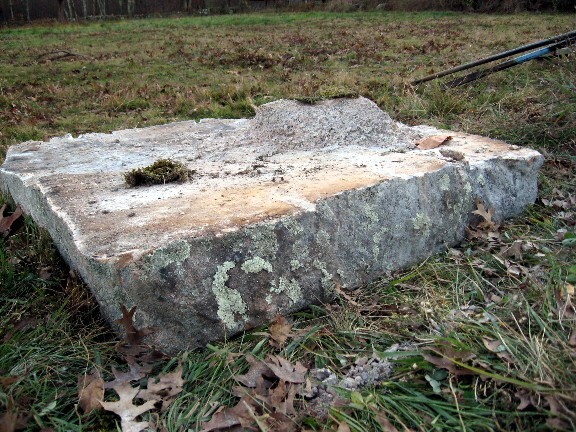 But we are optimistic that we will cleave apart two large halves of this slab. Note it is late in the day, & the sun is behind clouds. Once the generator shuts off, you will hear the distinct sounds of the dull tap on a fissure, and the crisp, bell like tap on a hard place. Uh-Oh! Near the end of this video, a crack leaves the hard place drill holes and heads for the side of the rock. This is not good. But we have done everything in our control to stay on the fissure. But the slab has its own ideas about what it is going to do. It is desperation time. The side crack gets larger, hiding under the dust. We hoped to split the rock and make it irrelevant, but it was too late. By the time we try everything, if you listen carefully, you can hear the rock repeatedly taunting us with a “Neener, Neener, NEE-NER!”. We are left with one big half side, and two “quarter sides” that are big enough to fit just fine at the far end of the bridge. The “Hard Spot” was a crystalline formation that retained it’s integrity. 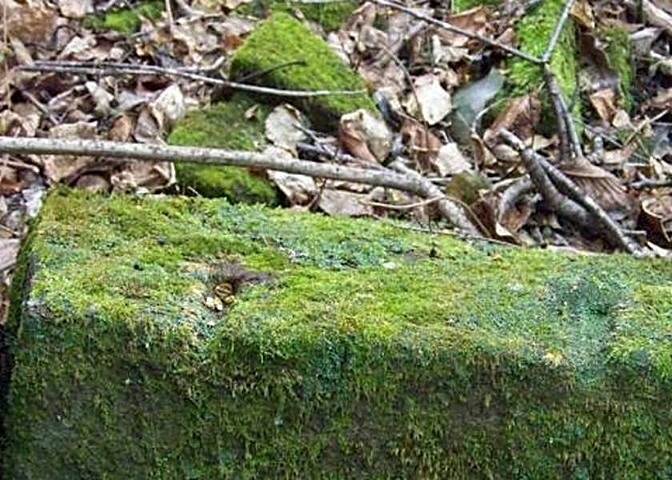 Wearing a moss hat, you can see the shape, like the underwater portion of a boat hull, which refused to separate from the complete half of the slab. In the “Quarter” pieces, you can see the outline where it cracked away from the other side, and it broke into sections. The two Quarters will work just fine, and if you hike over the bridge, now you know the rest of the story about the beautiful stone just before you step on to the Tomaquag Trail Bridge on the Grills Preserve parking lot side of Tomaquag Brook. But the job is not finished. 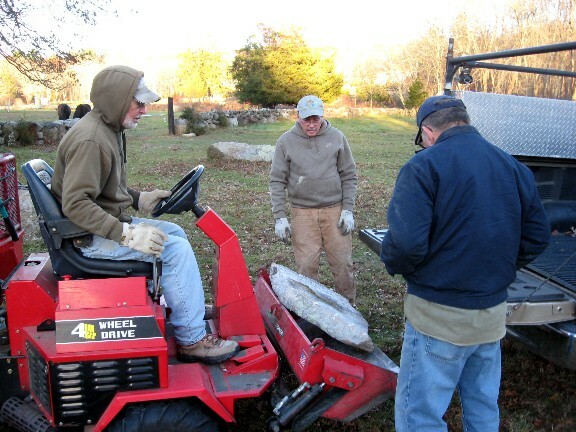 We expand to 3 men to wrangle the rocks into the truck. We are running out of daylight, and the temperature is dropping! 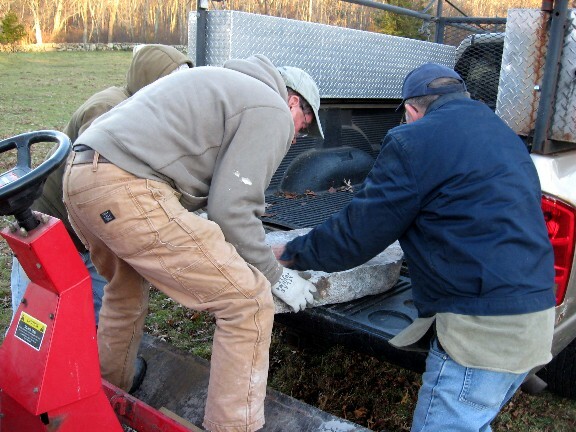 The problem we face is the bucket does not lift as high as the truck bed, so the plan is to get a portion of the quarter slab on the truck gate, and then slide it into the bed. Victory! We are 1 for 1 with loading the truck. There it sits, plotting new metamorphical tricks to mess us up. Quarter Stone #2 goes meekly, as we use wooden blocks to raise it higher. 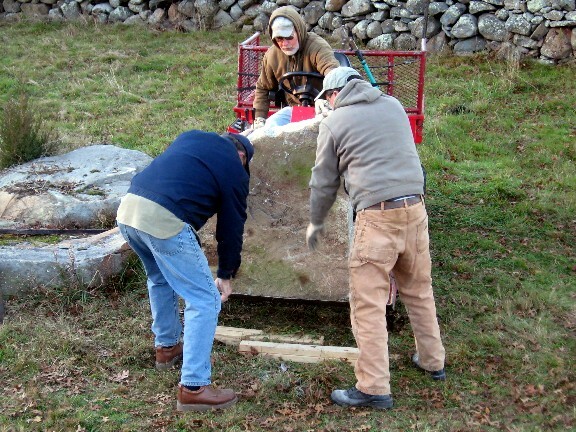 We begin to lever the stone halfway aboard the bucket. 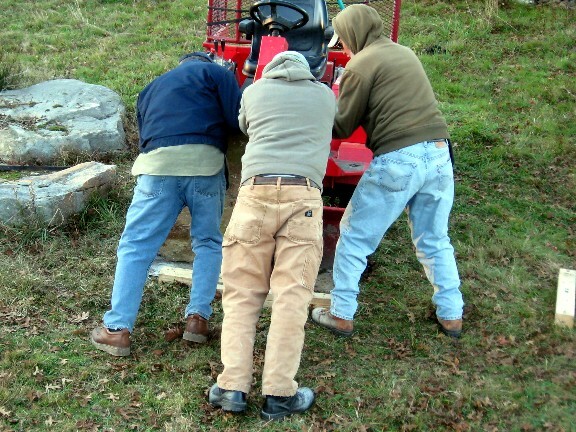 The 3 men rotate the slab upright in the bucket. All of this action is high on the list of things your insurance agent doesn’t want you to ever do. Harvey the “human flying buttress” holds it steady while Ted and Bob twist and slide it upright, into a stable position. It’s in the bucket, and rotated into position for “Slide Out”. Maybe. Easing it towards the truck. They are breathing hard for a reason, as the rock didn’t wanna leave home! Ted, Bob & Harvey: “You are an Incandescent Melon Head! Ted and Harvey tip it towards the truck gate. 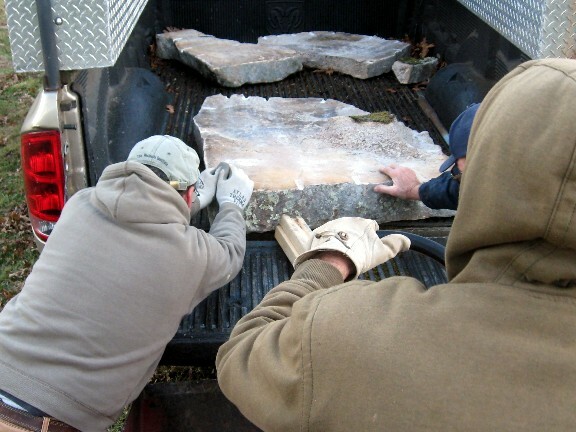 With a final shove, the 3 slabs are ready to start a new life on Tomaquag Trail. The slabs made their journey the 7 miles down stream along Tomaquag Brook. In fact, they ended up mere yards away from the familiar waters they resided near for the past 10,000 years. 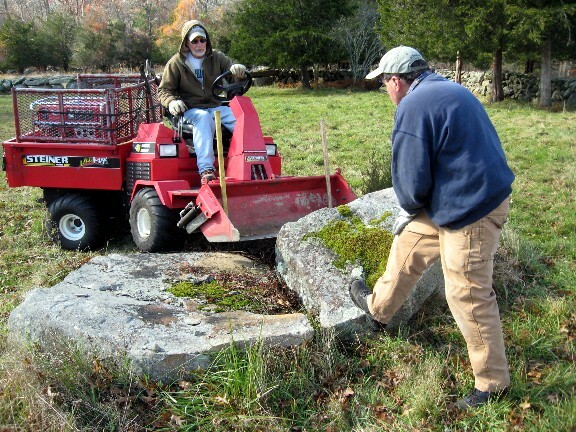 The quarter stones were moving to the far end of the elevated boardwalk. 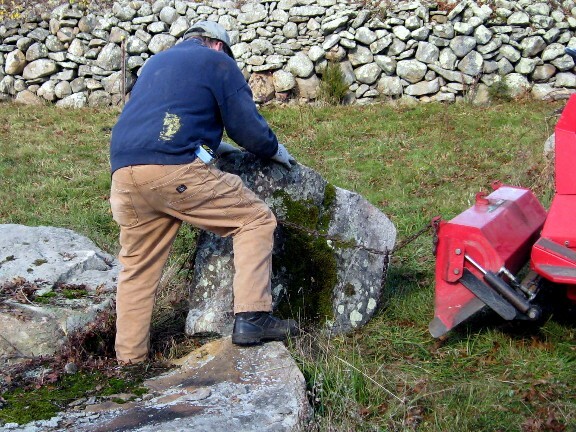 The stubborn stone was shown respect by the stubborn men that cut & placed it. It now resides in Honor, inviting hikers to cross Tomaquag Brook in style. The Hopkinton Land Trust invites you to come visit the tough old Metamorphic, who’s disposition seems to like being in the company of stubborn hikers, those ornery people determined to take the Tomaquag Trail to the end.